Armstrong Chumley, at No. 75 Clinton Street, raised a family of four daughters and a son; Emma, Mollie, Lea, James, and Ella Chumley. He was a religious man, regularly attending the Finley Chapel on Clinton Street for decades. However, his children tended to the darker side of society and would eventually ignite the incident that led to his death while serving as a Special Police Officer assigned to Fifth and Vine Streets. Thomas Snelbaker, the son of a Cincinnati mayor, had also tended toward the darker side of society. He followed his father into politics and was even appointed as a secretary of the Water Works and then Superintendent of the Police Department. However, after two years, he lost the latter position over allegations that he was steering prisoners toward favored attorneys. He then involved himself in the entertainment and variety show business. For a time, Emma Chumley was his consort. When Ella Chumley turned 18 in 1880, he took her as his mistress. Special Police Officer Armstrong Chumley’s grave site. Later, he began a relationship with Virgie Jackson, an actress in New Orleans. Still later, he returned to Cincinnati, took up again with Ella, and managed a burlesque house called the Vine Street Opera House. But, Miss Jackson also came to Cincinnati and soon Ella was again cast aside. On August 8, 1880 Snelbaker and Jackson were in the Vine Street streetcar when, unaware to either party, Ella, Emma, and James Chumley boarded. A brawl ensued and a crowd formed. The driver whipped the horses and pulled to the curb above Sixth Street where a police officer was standing – Officer Chumley. Officer Chumley boarded the car to quell the disturbance, as did other officers. All participants were to be escorted to the Ninth Street stationhouse and Officer Chumley was ordered there as well. Along the way, Snelbaker was permitted to enter Jake Aug’s club to tend to the wounds sustained in the fight. They also gave him a revolver which he secreted in his sleeve. He accompanied police peacefully to the Ninth Street stationhouse. Snelbaker withdrew his firearm, took two or three steps around the policemen and toward Officer Chumley and fired several shots. Sergeant Rittweger and other officers subdued Snelbaker. Officer Chumley, having been shot once in the groin and twice in the abdomen, went into a cell room and sat in an easy chair. Snelbaker was arrested and Officer Chumley was taken to his residence. When doctors advised him of the gravity of his wounds, he stated, “I have not lived the best life I might, but I am not afraid to die.” He died in his home on August 10, 1880. Officer Chumley left a wife, Mary, and his five children. On August 12, 1880, funeral services were held at the Finley Chapel on Clinton Street with an address from Elder W.P. Stratton. The church was packed in solid humanity including the choir loft. The pall bearers included; from the Police Relief Association, Lieutenants Borck and Thomas and Sergeants Thornton and Robinson; from the Special Force, Officers King, Ritter, and Stewart; and from the Odd Fellows, C. Pasquier, William H. Hackwelder, and J.A. Remley. Citizen escorts included Nathan Marchant and James L. Ruffin. The police detachment was under the command of the Police Inspector, Captain Meyer. Officer Chumley was the first interred on a family plot in Spring Grove Cemetery. James was buried with him in 1889, his wife Mary in 1901, and Lea in 1905. Emma, Ella, and Mollie were last known to be in New York City. On November 23, 1880, an indictment was announced against Snelbaker for manslaughter. He was acquitted on June 28, 1882 by a jury on grounds of self defense. He died six years later on March 15, 1888, in Chicago, from Focal Encephalitis (usually caused from an STD) and was also buried in Spring Grove Cemetery. This narrative was revised August 17, 2011 by Cincinnati Police Lieutenant Stephen R. Kramer (Retired), Greater Cincinnati Police Historical Society President. 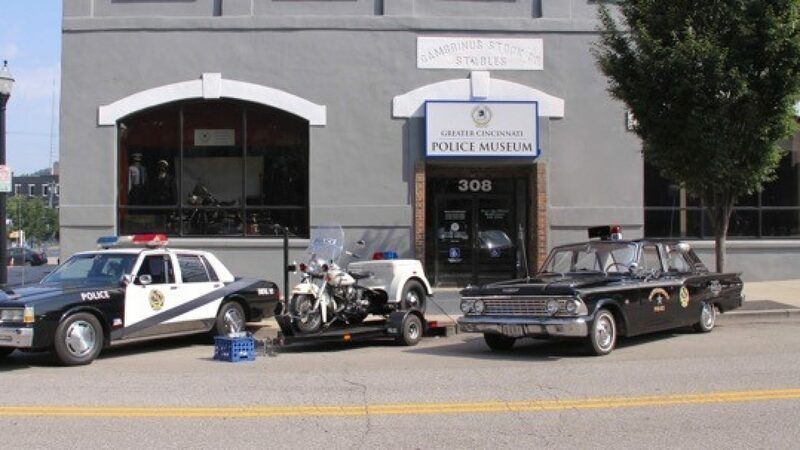 All rights are reserved to him and the Greater Cincinnati Police Historical Society.